Will Commercialization Deliver Social Justice? On the surface, legalizing marijuana might sound like a good way to address issues of systemic injustice. People of color are almost 6 times more likely to be arrested for all drugs, including marijuana, than whites. We need a holistic approach that addresses the causes – not just the symptoms – of injustice. Removing criminal penalties for marijuana possession as part of a comprehensive marijuana policy is a must. Legalization, however, goes too far and creates a multi-billion dollar industry whose impact exacerbates many of the underlying contributors to systemic injustice. That is the number of states that have seen a significant reduction in their prison population as a result of legalization. Legalization has been heralded as a way to reduce the number of people of color incarcerated yet despite reductions in the arrests for marijuana possession in states that have legalized, the prison population has remained stable and in some cases actually reversed years of decrease to an increase since legalization. While it is too early to say whether legalization has caused these increases in the prison population, we can objectively state that it has not decreased the prison population anywhere. That is how many more liquor stores exist in some low-income communities of color compared to other areas. Click here to see a breakdown of emerging data of pot shop locations. Many people often say that we should regulate marijuana like alcohol. While this may sound great to people of a certain economic demographic and living in certain areas, the reality of regulating marijuana like alcohol is much more sobering. Many residents in lower-income communities of color already have the blight a liquor store on every corner. Advertisements for tobacco and lottery tickets abound. The reality of legalization and commercialization is that these same communities will now be burdened with an oversaturation of pot shops on every other corner as well. 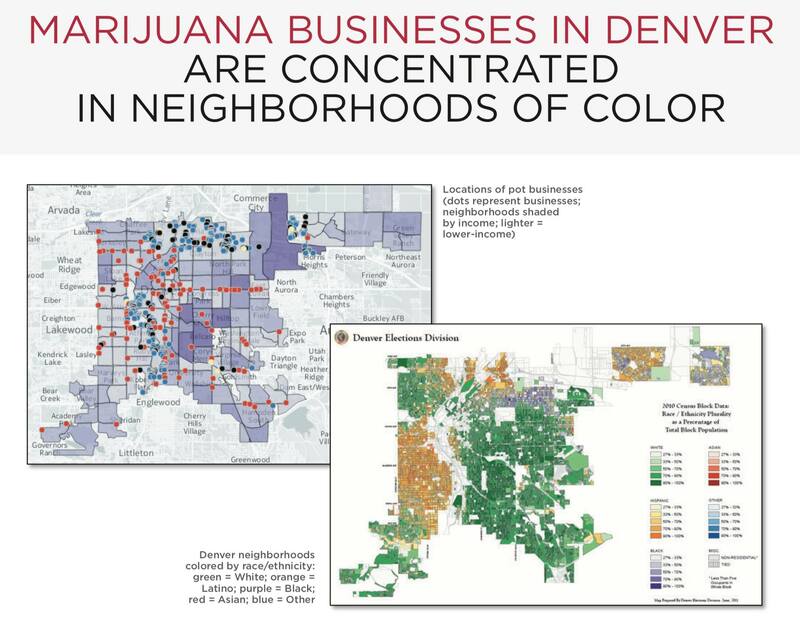 As reported in the Denver Post, some low-income areas in Denver Colorado, there is one marijuana license for every 47 residents. Legalization does not equal true reform. For those who sincerely care about criminal justice reform, one of the most troubling factors of marijuana legalization is that it leads well-meaning citizens to think that they voted for criminal justice reform when the reality is no true reforms have been made. Where there are issues of systemic injustice and racism, legalization does not address the root of these issues and instead only exacerbates these problems by promoting increased drug use and the accompanying negative social consequences in disadvantaged communities. Legalization often delays true reform by tying expungements, pardons and social reforms to the approval of a predatory industry rather than demanding that these reforms be made whether or not the industry is legalized and commercialized. It is putting a price on justice. That is unjust.